Fall is in the air and one of my favorite things to wear in the fall is a scarf. Skinny, chunky, fancy, fluffy; it doesn’t really matter. 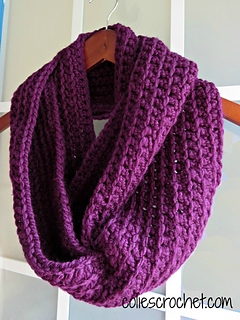 This is a simple scarf to make, in fact you only need to know three crochet stitches: slip stitch, chain and half-double crochet. 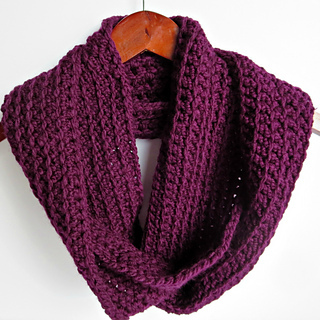 The chunky yarn makes it really warm and the yarn is super, super soft. If you don’t have chunky yarn on hand, you can even use two or three strands of worsted weight yarn together and achieve a similar look. I am including directions for a long, skinny version and for a smaller, thicker version as well. 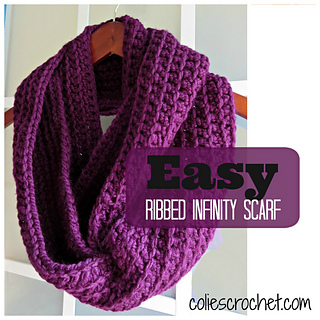 With this pattern, you can make a scarf in a little over 2 hours! • M-9mm hook; I used a Susan Bates hook. • I Love This Yarn Chunky in Plumberry. I used almost 2 3.5 oz. skeins. Any #5 Bulky yarn would be an acceptable substitute. • Yarn or tapestry needle to weave in ends.